The British newspaper The Guardian took the above passage and published a story that begins “A global shift towards a vegan diet is vital to save the world from hunger.” For those unfamiliar with veganism, it is a strict form of vegetarianism that excludes not only the eating of meat, but also any food derived from animals such as milk, cheese, and eggs. Vegans – people that follow a vegan diet – often decide to follow a vegan diet for ethical reasons as a protest for animal rights and welfare. Other people are vegan for health reasons or to minimize the environmental impact of their food consumption (the same rationale as the UNEP’s report). Interestingly, the UNEP report never uses the term “vegan” to describe its conclusions in the actual report. While The Guardian probably used the term “vegan” for sensationalism the environmental impact of an animal intensive diet is quite severe. The same article quotes the lead author of the UNEP study, “Animal products cause more damage than [producing] construction minerals such as sand or cement, plastics or metals.” Indeed, it takes lots of resources to produce meat. For instance, it can take up to 16 pounds of grain and 4,000-18,000 gallons of water to produce 1 pound of beef according the U.S. Geological Survey. Thus, it is no wonder that the UNEP sees reducing reliance on animal products as a key focus for sustainable development. With crude oil prices hovering near $100 per barrel, the issue of energy independence is sure to be a frequent topic in the upcoming presidential election. Don Fullerton, a finance professor and energy policy expert at Illinois, spoke with News Bureau Business and Law editor Phil Ciciora about whether the goal of energy independence is a viable one or just another pipe dream. Is energy independence a realistic goal for the U.S.? It seems like it’s mostly senators from oil-rich states who want to talk about oil and energy independence, because they want subsidies for the oil industry. So it’s really only for political reasons that energy independence has been hyped as an important or worthwhile goal. If we really are concerned about reducing our dependence on foreign oil, then the implication is to tax oil, not to subsidize it! A tax on oil would discourage its use, which would have three good effects. First, it would discourage imports. Second, it would reduce drilling in the U.S., and thus help keep more oil in the ground for future contingencies. Third, it would encourage the development of other energy technologies such as biofuel, solar power, wind power and better battery technology. Those other technologies are the only realistic route to true energy independence. Plus, there’s absolutely no way we’re going to achieve energy independence through oil because we’ve basically used up most of our oil. For all practical purposes, we don’t have much more oil. That’s why we either have to rely on other countries or switch to new technologies. An attempt to achieve energy independence would also be a bad move for energy security, because it just says, “Let’s drain America first.” If so, we’ll be in an even worse situation later. Whatever we still have in reserve should be left there for its option value. If we did have another serious war where we really needed oil that we couldn’t import, those reserves might be good to have. Do the new sources of domestic energy in the Dakotas and the Gulf of Mexico hold much promise for solving our energy problems? Sure, there are some new sources of energy in the U.S. – really, natural gas and shale oil – but however much we have won’t bring us any closer to energy independence. Even if we do discover a few new fields of crude oil, it’s not going to make much of a difference. As the price of crude rises even higher, the oil companies can go back to old and existing fields and drill a little deeper. That extraction is expensive, but it’s worthwhile if the price of oil is back near $100 per barrel. It wasn’t worthwhile earlier because the extra drilling cost was more than the oil was worth. But now that the price of crude is high enough, they can make money if they drill deeper on these old wells. What happens to energy prices if the European economy continues to sputter? If Europe experienced, say, a 10- to 20-percent drop in gross national product, then you might actually notice a dip in the price of oil in the U.S. But economic growth in the U.S. would also slow. So just because the price of oil might fall a little bit doesn’t make their troubles good for us, since we would be affected, too. We certainly don’t want to hope for a recession in Europe to make oil cheaper. First of all, the price wouldn’t fall that much. Second, there would be a whole host of negative implications for the U.S.
What (if anything) will bring the price of oil down again? The only ways to get a significant change in the price of oil would be through a major recession, a major technological breakthrough, or huge policy changes. If the whole world got together and agreed to a new, stringent version of the Kyoto Protocol to reduce carbon emissions, that would have an impact. If the whole world were to reduce the burning of fossil fuels by 20 percent – that would also have an effect. But we don’t want another recession, nor will all nations agree to such a treaty. Christmas Lights: A Tale of Cheer? Christmas lights are a funny thing. Many people hang lights on the outside their homes during the holiday season. The light displays run the gambit from small affairs around a door to enormous light extravaganzas on every surface, tree, and shrub. The quality of a display varies greatly depending on the skill and effort exerted by the homeowner. It is curious though–Since the lights are on the outside of the house where the owner cannot see them, why do they exist? To begin, I list (some) benefits of Christmas lights. One, to be fair, the owner does see the lights for a brief moment when she comes home at night, providing an aesthetic joy. Two, a religious homeowner can be use a holiday light display to advertise her beliefs. Three, passer-bys and neighbors receive the enjoyment of looking at the display (if it is well done, of course)! This last benefit is a classic positive externality, where non-displayers receive benefits without incurring the cost directly. Next, I list (some) costs of Christmas lights. One, the displayer holiday lighting increases their electricity bill compare to normal electricity usage. For large displays the electricity cost can be quite high, and I have seen houses that never turn off their Christmas lights from Thanksgiving until Easter! Two, the extra electricity usage requires more production from power plants that likely burn coal, leading more air pollution and greenhouse gases. Three, excess lighting creates a phenomenon called “light pollution” that impedes car driver sight-line at night, disturbs nocturnal animals, and blots out the stars. These last two items are negative externalities. On net, it is hard to say if Christmas lights are “worth it” for the displayer. It is even harder to determine if they are a net benefit for society when the externalities are added-up. Regardless, Christmas lights are an ingrained tradition in America, and will be around for foreseeable and likely distant future. Hopefully with increasing awareness about the costs of holiday lights, people will consider lower impact decorations such as low-wattage bulbs, or putting existing lights on timers so that they turn off over night. Happy holidays and joyous New Year! A frequent claim about homeowner’s, flood, and earthquake insurance (I will use the term “home insurance” for short) is that not enough people have it and those who do don’t have enough of it. Lots of explanations have been put forward, ranging from underestimation of risks to expectations of government aid. But there is at least one more (rarely discussed) rational reason for some US residents to not buy home insurance – the US tax code. You cannot deduct home insurance premiums from your taxes. The legislators probably figured that it’s a purchase like any other, so why should you be able to get a break for buying it (let’s forget about the deductions for having children and a mortgage for a second)? However, you can deduct disaster-related losses from your taxes. Again, that may be a reasonable rule on its own – we can think of the loss as a loss of income that you had at some point. When you put these two things together, you get a real disincentive to buy comprehensive insurance. In some cases, homeowners can even deduct losses from past tax returns and get those taxes back. I’m not going to claim that this means people should have no insurance. But for most people, it will make sense to have a fairly high deductible. To clarify, a fairly high deductible (as much as the homeowner can comfortably afford) is already recommended by most experts based on insurance prices, but my claim is that people should choose a deductible that’s even higher. Here’s a numerical example. Suppose that your taxable income has been $50,000 a year for the past three years and your federal income tax rate is 10% (or $5,000). You own a $200,000 home that’s located in a flood plain. For simplicity, let’s say the only risk is a 1% annual chance of $100,000 damage to your home. Actuarially fair insurance would then cost $1,000 per year. So if you buy insurance, you pay $1,000 per year for certain but don’t have to suffer any losses. Now suppose you choose not to buy insurance and you suffer the loss. You can deduct it from your tax returns for this year and next year (or even last year in some cases), which would get you $10,000 of that loss back. So it’s as if you only lost $90,000. Of course, that’s still a lot of money, but now that actuarially fair insurance looks like it has a load factor of 0.9. And, by the way, you probably can’t get actuarially fair insurance in the first place. Finally, suppose you can get a loan to repair your home. You borrow $90,000 (because you got $10,000 from the government) at 5% interest for 5 years. According to a handy online mortgage calculator, the monthly payments for that kind of loan will be $1,698.41 and this loan will cost you $101,904.66. Not bad, considering you didn’t have to pay premiums for all those years. To summarize, if the interest rate that you can get is low enough and you’re young enough, you may be better off buying insurance with a very high deductible (or foregoing it altogether), deducting the resulting losses from your taxes, and getting a loan to repair the damage. Of course, bigger losses will make insurance more appealing, but if the loss is moderate relative to your income, absorbing it shouldn’t be that hard. And if I were an insurance company, I would campaign hard to make insurance payments tax-deductible. Just a couple days ago, the Wall Street Journal reported that “U.S. exports of gasoline, diesel and other oil-based fuels are soaring, putting the nation on track to be a net exporter of petroleum products in 2011 for the first time in 62 years.” Taken literally, this fact is strictly “correct”, but it is misleading. It is therefore very poor reporting. The authors either don’t understand the words they use, or they are deliberately trying to mislead readers. The reason it is misleading is because the article implies the U.S. is headed toward “energy independence”, and that implication is wrong. It goes on to say: “As recently as 2005, the U.S. imported nearly 900 million barrels more of petroleum products than it exported. Since then the deficit has been steadily shrinking until finally disappearing last fall, and analysts say the country will not lose its ‘net exporter’ tag anytime soon.” That statement and several expert quotes in the article clearly imply the U.S. is headed toward “energy independence”. Strictly speaking, the WSJ is correct that the U.S. exports more “petroleum products” than it imports, … but “petroleum products” do not include crude oil!! “Petroleum products” include only refined products like gasoline, diesel fuel, or jet fuel. The implication is only that the U.S. has a large refinery capacity! 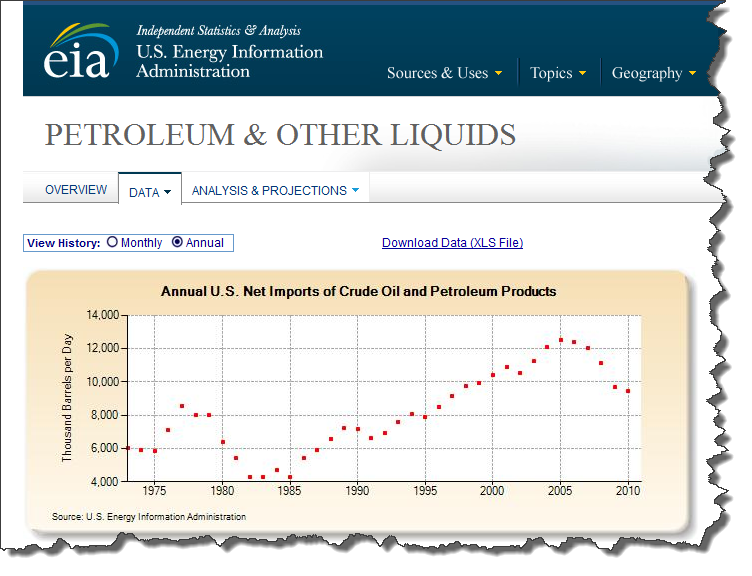 The U.S. is a huge net importer of crude oil, and a huge net importer of all “crude oil and petroleum products” taken together, as you can see from the chart below (provided by the U.S. Energy Information Administration). In other words, we import boatloads of crude oil, we refine it, and then we export slightly more refined petroleum products than we import of refined petroleum products. Big deal. If the WSJ reporters knew what they were talking about, or if they were not trying to mislead readers, then they should have just stated that the U.S. is a huge net importer of all “crude oil and petroleum products” taken together. They didn’t. That is why I conclude they do not understand the point, or that they are trying to misrepresent it. Neither conclusion is good for the Wall Street Journal. They are simply wrong when they say: “The reversal raises the prospect of the U.S. becoming a major provider of various types of energy to the rest of the world, a status that was once virtually unthinkable.” Just look at the figure! 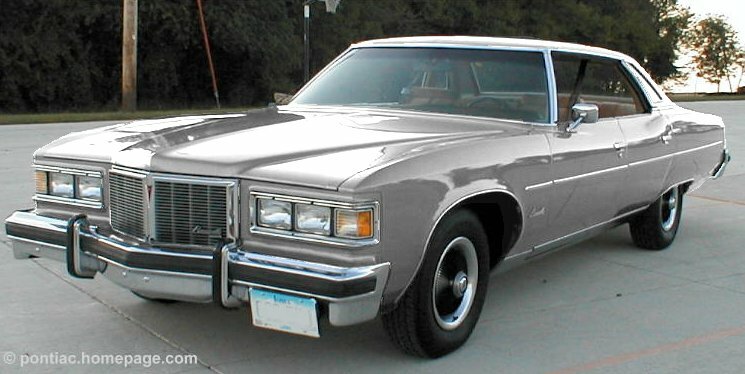 To Reduce Energy Use, Buy an 8-cylinder 1980 Bonneville! My green choice is to get about 12 miles to the gallon. Here is why it’s so green. Some people think it’s obvious that I ought to buy a hybrid or other fuel-efficient vehicle. But that’s just wrong. Certainly some drivers should have a hybrid car to reduce emissions and energy use, namely somebody like my brother who has an hour commute each day, driving 20,000 or more miles per year. But not everybody. Take for example a person like me who lives near work, rides a bicycle, and doesn’t like spending hours in the car – even for a road trip to the Grand Canyon or Yosemite. I use the car once a week for the grocery store, or a restaurant, driving less than 5,000 miles per year. Let’s suppose a hybrid gets 50 miles per gallon, so my 5,000 miles per year would cost about 100 gallons ($300 per year). The standard non-hybrid gets 25 miles per gallon, which would cost twice as much ($600 per year). I’d save $300 per year in the hybrid. But that doesn’t mean I should buy a hybrid. A new hybrid like a Toyota Prius costs about $6,000 extra to get that great fuel-efficiency (about $26,000 instead of $20,000). In other words, it would take twenty years for my $300-per-year savings to make up for the extra $6,000. It’s not worthwhile for me. If my brother drives four times as much, however, he could break even in just five years. So far, that means I should not buy a hybrid. Does that mean I buy the normal new car with 25 mpg for $20,000? No! I should buy a beaten old 8-cylinder Bonneville, which looks like a tank and gets only half the mileage! That Bonneville may be headed for the junk heap, so it’s certainly cheaper, even if I have to pay more for gas. But even ignoring the price of the Bonneville, I claim that the fuel-use of the Bonneville is less than the fuel use of the normal new car! Why? Consider the emissions from fuel used in production. The fuel used to make the Bonneville back in 1980 is a “sunk cost”, a done deal that does not change whether that car gets junked now or later. In other words, keeping that Bonneville off the junk heap requires no extra fuel and emissions to produce it. But buying a new car does involve more fuel and emissions just to produce it. Think about all the emissions from the steel mill, the tire factory, the glass furnace, and the electric generating plant that provides power for the tools and machinery to make the new car. In other words, I can reduce total fuel use and emissions much more if I purchase the 1980 Bonneville and drive it 5,000 miles per year, than if I buy a new car with twice the mpg. Now all I need is a bumper sticker for my 1980 Bonneville to say how green I really am! This week I came across an interesting website called The World’s Water from the Pacific Institute that collects data about freshwater supply and usage by country. I already knew that the United States consumes a lot of water, but I want to use this website to compare quantitatively how much water the U.S. used relative to rest of the world. Not surprisingly, the data reveal that on a per capita basis, the U.S. consumes the most freshwater of all countries with large water supplies. Furthermore, if all countries had the water consumption rate of the U.S., then total worldwide freshwater withdrawals would become nearly three times greater. To begin my analysis, I note three interesting facts about U.S. freshwater supplies and consumption, using data from the website cited above. First, the U.S. ranks 4th in annual renewable freshwater resources with 3,069.0 km^3/yr, and ranks ahead of Indonesia but behind Canada. Brazil ranks first in freshwater resources with more than 2.5 times as much as the United States. Obviously, larger countries in land-mass have an advantage in this ranking, since more area provides more opportunity for freshwater resources, all else equal. Second, the U.S. ranks 9th in annual freshwater withdrawal per capita, and ranks ahead of Suriname but behind Tajikistan. Interestingly, the countries that surround the U.S. in this ranking are not similar to those countries in the previous ranking, with the exception of Canada that occupies the slot three places below the United States. In particular, the countries near the top of the consumption per capita list are generally low on ranking of total freshwater supply, meaning that countries with large supplies like Brazil can be low on the consumption ranking (where Brazil is 87th ranked). Third, the U.S. uses 1600 cubic meters per person per year (m^3/p/yr) of freshwater. In comparison, China only withdrawals 550 m^3/p/yr of freshwater, almost 3 times less (where China is 71st ranked). Thus, the U.S. not only has a high ranking in withdrawals per capita, but has significantly larger withdrawals. Finally, I apply the per capita withdrawal rate in U.S. to all countries and find that the worldwide total withdrawal would almost triple compared to current levels. Of course, increasing the quantity supplied of freshwater comes at a higher cost. Therefore, as the demand for freshwater increases as worldwide GDP levels increase, then the amount of money spent freshwater consumption will increase dramatically! I usually learn something new at every conference, and this weekend was no exception. Timothy Fidzgerald of Montana State University presented a joint paper on the Wild Horse and Burro Program. I didn’t know this, but the Western US has a substantial (nearly 40,000) population of wild horses and burros, which originated from the escaped animal population of early settlers. Today, they are officially protected by the US government (i.e., you cannot capture or kill them). It also happens that these horses have no natural predators, so their population would constantly be rising were it not for periodic “gathers” of these horses. Now, don’t worry, these horses aren’t then killed. They’re de-wormed, vaccinated and put up for adoption or sale (but not to slaughterhouses). So what is a post like this doing on a policy blog? Well, the cost of this program last year was $65 million and is continuously rising. The problem is that holding a horse costs about $13,000, but most end up being sold at a fraction of that price. The largest cost of the program is holding the horses and the revenue is not nearly high enough to offset that. The only population controls are the periodic gathers of the horses; there is no sterilization program. Moreover, there is a price floor on the adoption fee for the horses, even though a good portion of the horses is not adopted. Don’t get me wrong; I’m a big advocate of the humane treatment of animals. But it seems as though sterilizing and re-releasing some of these horses would be a much more cost-effective way to control their population (and the horses might prefer that too!). No one would suggest that sterilizing dogs and cats is inhumane; in fact, most animal groups believe that IS the humane thing to do. Unfortunately, it also seems as though there are relatively powerful horse advocates out there who are staunch opponents of sterilization. So once again the government is captured by an interest group which insists that we continue to spend money on an unsustainable (and I would argue not well thought-out) program. This does not seem like a sustainable program to me. Luckily, it is costing us only $70 million (at least this year), which is small change compared to some other government programs. But (a) it is growing at an unsustainable pace and (b) it makes me wonder how many other such programs are out there. PS Many of the facts are taken from Fidzgerald’s paper, but all the opinions are my own. What is the meaning of a budget number? With all the argument in Washington about how to balance the budget, a reminder is worthwhile that none of these numbers make any sense at all! What “should” be the meaning of the government budget? And, does any number provided by anybody actually have that meaning? In general, a budget deficit is supposed to mean that one’s current consumption exceeds income, which would indicate a decrease in wealth. Indeed, that’s the problem with a deficit – drawing down our wealth (which could even turn from positive to negative!). The U.S. Federal budget numbers fail to provide such a meaning, for several reasons. First, the Federal budget includes ALL spending, not just consumption. Some of that spending is actually investment, such as new spending on buildings, bridges, roads, airplanes, and any long-lived military equipment. The budget does not show the breakdown between what we really use up this year, and what spending is really investing in the future. Second, Social Security is “off-budget”, unless you are looking at a unified budget. Okay, I said that in a way that is intentionally confusing! The basic problem here is that social security is SUPPOSED to run a surplus, so that we can set aside some funds from those now working to pay them when they are retired. If it does not run a surplus to save for the retirement of the baby boom generation, then we’ll be in big trouble when the baby boom generation retires! The current social security surplus is too small for that. Then, however, the big problem is that the unified budget mixes the social security budget with the rest of federal spending. So when you see a deficit in that account, it’s really worse than it looks, because it includes the small social security SURPLUS that’s already not a big enough surplus for social security to break even! Third, the U.S. Federal Budget is confusing about what is a “Tax Expenditure” and what is government “Spending”. A tax expenditure is really ‘spending via tax break’, as when a taxpayer gets a special credit or deduction for doing some particular activity. The Congress could instead have accomplished the exact same thing by an ACTUAL spending program, providing subsidy to the same set of eligible individuals for doing the exact same activity. So it really does not make much sense to say you want to cut spending and not raise taxes, because eliminating one of those tax breaks is really the same as eliminating an equivalent spending program. Fourth, a Federal “mandate” might require a certain kind of spending by a firm. To take a simple example, suppose some safety regulation requires construction firms to provide a hard hat to all workers. That’s really equivalent to a tax on that firm, equal to the amount they have to spend on hard hats, where the revenue of that “tax” is spend by government on the provision of hard hats. But then the problem is that mandates are so pervasive. Some ‘true’ measure of the size of government would be HUGE, if we counted the dollar cost of all mandates as a “tax”, as if it were in the government budget. If one town’s water pollution flows into another town, the two towns can negotiate a solution with no need for the state to intervene. But if all towns are polluting all neighboring towns, the lines of communication are too complex to negotiate – requiring the state to pass a law to solve the problem. If one state’s water pollution flows into another state, the two states can negotiate a solution with no need for Federal intervention. But if all states are polluting all neighboring states, the lines of communication are too complex to negotiate – and it takes a national government to solve the problem. In other words, those problems have solutions. If one nation’s water pollution flows into another nation, then (potentially, at least) the two nations can negotiate a solution with no need for a global government to intervene. But if all nations are polluting all neighboring nations, the lines of communication are too complex to negotiate – and no global government exists to solve the problem. I’m currently pessimistic about two of the worst problems the world has faced: global climate change, and global financial contagion. Both are “externalities” in the classic sense. Each nation’s greenhouse gas emissions pollute the whole world, and the only really effective solution is a worldwide global agreement to reduce emissions. In fact, we don’t really “need” all nations to reduce emissions; all we really need is an agreement among all nations saying that if SOME countries reduce emissions then the other countries won’t increase emissions to steal their business. But the lines of communication are too complex to negotiate – and no global government exists to solve the problem. Environmental policy is my usual bailiwick. At the moment, however, I’m even more worried about global financial contagion. It seems that one small country can have lax financial regulations that allow banks or investment companies to take on too much risk. Or a small country can overspend, taking on too much debt. In the olden days, that country could go down in flames, with no big problem for the rest of the world. With tremendously increased globalization, however, all financial markets are highly integrated. One country’s borrowing may come from any or all other countries of the world, and one nation’s problem become the world’s problem. If banks in other countries loan to that small country, then a financial crisis in that small country may create fear about the financial well-being of the banks that lent to them, causing a run on the banks in all those other countries. Moreover, globalization means much more trade in commodities. If one small country faces severe financial difficulties and must cut back all spending, that reduces aggregate demand worldwide, and can spread a recession worldwide. A strong global government could rein in the poorly managed countries by requiring larger capital requirements, careful financial scrutiny, and only tax-financed spending. But we don’t have any such global government. As a result, even a small country like Greece can over-spend for years without oversight. The situation in Greece may be made worse when banks in other countries raise the rate at which Greece can turn over its debt and borrow again, making the financial situation in Greece even worse. The problem may be caused by Greece or not. Regardless of “fault”, if Greece any small country were to go into default in years past, then the cost would be primarily on that small country. Now Greece could go bankrupt and impose horrible costs on the entire World?! ?